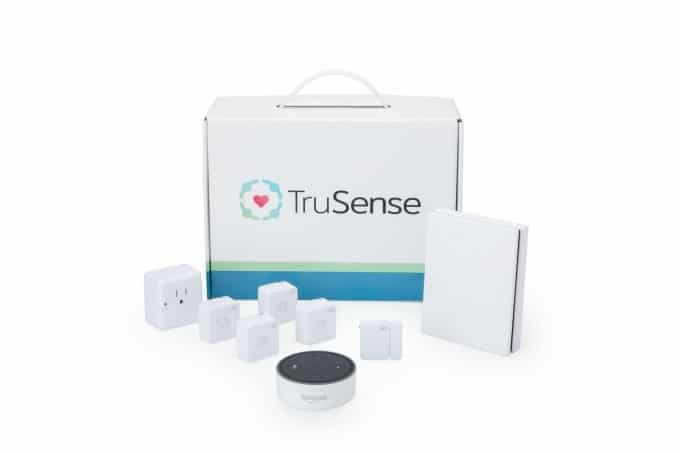 If my Grandma June were still alive, I know she would appreciate the value of a TruSense system in her home. My grandma was a very independent woman who liked to keep busy helping on her partner’s farm and keeping her home impeccably tidy. When she had to go into an assisted living facility, she was miserable. She even tried to escape a few times and they had to put her in a locked ward for her own safety. Had we known about TruSense back then, I think she could have spent a couple more years in the comfort of her home. She would have enjoyed her independence and our family would have had peace of mind knowing she was ok.
Are you intrigued yet? 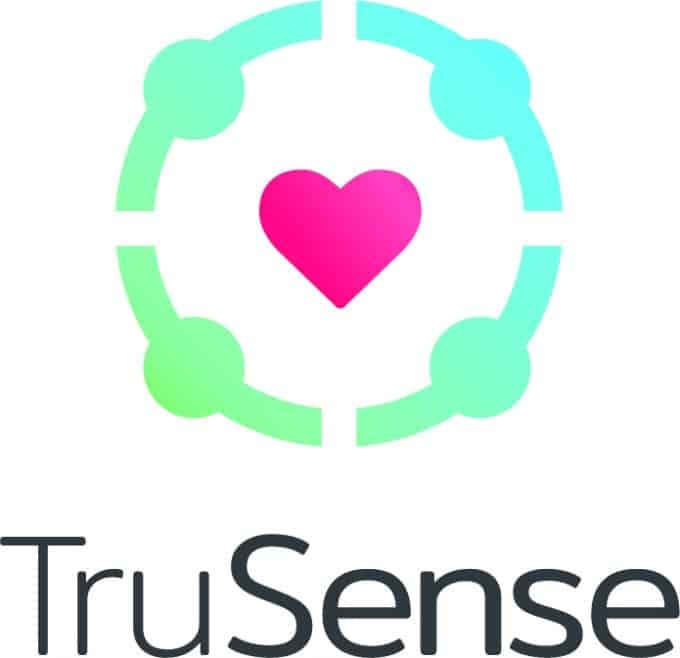 TruSense is truly remarkable and a game changer for anyone who worries about older parents or grandparents. 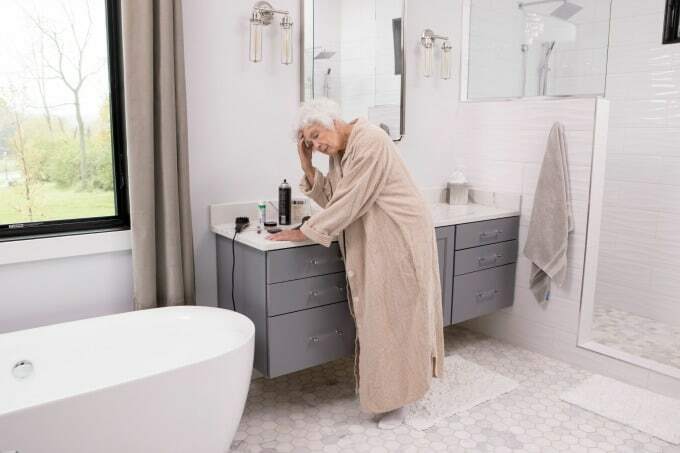 It’s a smart home technology for seniors to allow them to stay in their homes longer while keeping tabs on their wellbeing for caring family members. Think of it like buying a system that will bring you peace of mind and to help alleviate some worry about older loved ones. TruSense is there when you can’t be. 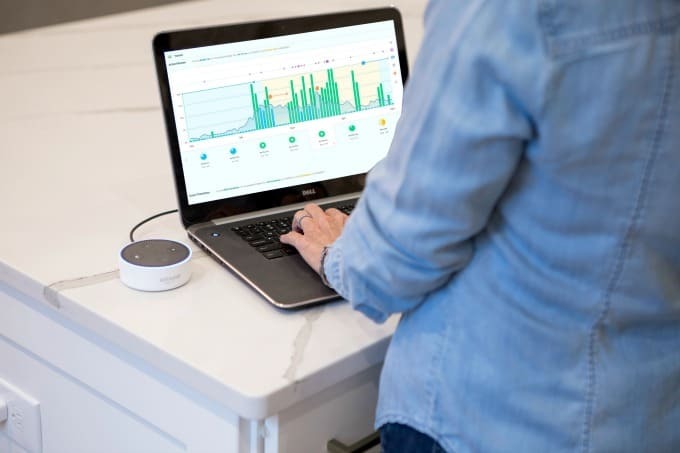 TruSense uses wireless sensors, Amazon Echo Dot and GPS technology to track a senior’s daily activities. It can tell how much time a person has spent sleeping, in the kitchen, or when they leave the house. TruSense will update family members if it notices a change in a pattern and can even notify a 24/7 emergency monitoring center if need be. It also has other health and safety measures like home leak detection, temperature, vehicle and personal GPS tracking. It also tracks caregiver visits if your loved one receives home care so you’ll always know how much time a visitor spends in the home. It’s important to mention that TruSense is not a wearable pendant or device. It’s so much more than that. It’s non-intrusive so it won’t interfere with your loved one’s daily life. TruSense is great for older parents or grandparents that you are providing care for at home. Many times, older people resist going into assisted living and TruSense is a viable way that they can still be cared for properly in their home. My Grandma June suffered from dementia in her later years and I loved learning that TruSense has a partnership with GPS SmartSole so that people in the early stages could stay in their home longer. Grandma used to get lost easily and with this technology, her location could be tracked and real time alerts sent to her caregivers with her location via the web, phone and text. Family members can also use the Amazon Echo Dot to check in on loved ones, too. The first reason that sticks out to me is peace of mind. You’ll know that your loved one is ok at all times. It’s a win-win. They get to stay in their home longer and you can trust that they are ok with the help of TruSense. Another big reason is the astronomical costs of assisted living facilities. In some states, the costs can be as high as $6,000 a month! Yikes. The place where my Grandma lived was $3,000 a month and I thought that was crazy high. Many seniors are on fixed incomes and simply cannot afford it. It’s a huge financial burden on a family. Caring for an aging family member is a lot of work. TruSense helps to ease that burden by providing you with key information on health and wellness of your loved one. It’s there when you can’t be. Like I mentioned, your family member does not have to wear a device at all. Wearable devices can easily be removed and have to be charged which can be forgotten. It is the ONLY solution that offers multiple layers of protection giving you a fail-safe system. Because it uses multiple technology options like the Amazon Echo Dot, Motion Sensors and GPS, it allows for redundancy so you always have a back up in place. How Much Does TruSense Cost? The short answer is a whole lot less than a month at an assisted living facility! The TruSense Starter Kit with all the equipment is $299. The monthly subscription fee starts at $27.99. Well worth it, in my opinion! Where do you Buy TruSense? Visit TruSense to learn more and to purchase a system for your loved one. This video shares a bit more about what it’s all about. Do you know anyone that could benefit from TruSense? I encourage you to share this post with them to spread the word about this amazing technology that can help so many families. I love those custom tailored alerts that can be programmed.